For millions of fans worldwide, happiness is watching a soccer match. 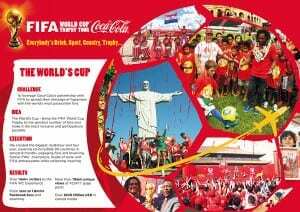 As an official partner of FIFA, the international governing body of association football (aka soccer), Coca-Cola tapped into the global excitement of the 2014 World Cup to ensure that teen and young adult fans around the world associated that same sense of happiness with its soft drinks. With agency Ignition, Coca-Cola implemented a three-part campaign. The first element, the Trophy Tour, brought the World Cup trophy and a hologram film of memorable moments in soccer history to 90 countries in nine months. More than 1 million fans took personalized photos with the trophy, which many of them were thrilled to immediately share via social media. Coca-Cola created its own videos of fans with the trophy that it shared on YouTube; these received more than 1 million views. The Trophy Tour Facebook page registered more than 4.4 million fans, while the tour itself generated more than 5 billion (yes, billion) media impressions. The Happiness Flag tied into the custom of unveiling countries’ flags on the pitch prior to a match. Coca-Cola encouraged fans in all 207 countries where its drinks are sold to submit photos of themselves for a photomosaic flag. Spanning nearly three-quarters of an acre, the flag was unveiled on the pitch before the World Cup’s opening match. Participants could then go to a dedicated website to search for their photo among the more than 223,000 submitted pictures, zoom in, and share it via social media. Approximately 2.8 billion people worldwide watched the live unveiling of what was the world’s largest photomosaic flag, and tweets associated to the flag made approximately 703 million impressions. The third element, the International Flagbearer Program, selected 96 teens from around the world to carry their country’s flag onto the World Cup pitch as the official flagbearers. While Coca-Cola didn’t share any metrics associated with this aspect of the campaign, it’s safe to say that the experience made the flagbearers lifelong ambassadors of the brand.